Steven Kasher Gallery is proud to present two exhibitions by A-CHAN. The first, titled Off Beat, runs from March 28th through May 4th. The show is comprised of twenty black and white photographs made in New York between 2008 and 2009 and is drawn from the publication A-CHAN, Off Beat (Steidl, 2012). The second exhibition, Vibrant Home, opens May 8th and runs through June 8th. This exhibition will feature color photographs taken in Tokyo, 2000-04, in Fujishiro, 2004-06 and in New York City, 2006-08, which are featured in A-CHAN, Vibrant Home (Steidl, 2012). What time do you like to photograph? During day time. I don't know if I like to photograph just before sunset, but I have photographed a lot during that time, before going home, getting dark. How do you know when to press the shutter? Intuition and combination of pieces and pieces. Who is your favorite artist? Beside Robert Frank, Edward Hopper. What kind of light do you like? Do you like to print? It is ok, because I am very fast. When and what did you make your first photograph? 18 years old. I think I photographed an oil heater. There were two buttons on the top, red and green. Who do you show your pictures to? Do you work in a series? No, I normally don't make any concept before photograph. I let it be free. When does a series start and end? After certain numbers of prints. I try to listen what story they hold and find the way how I could put them together. Do you like to make books? I do very much. But in order to make sequence, I have to get lost thousands times. From where came the name A-CHAN? It was my nickname. The reason I use the name is because she seems like she is my friend. Do you like to be in New York? I know there is not many chance in my life to be able to feel so important. I feel that now, to Robert and June. I like to be here and that is very sure. What is photography for you? For me it is more like things in refrigerator next to scallion. But also a key to accept myself or to be a better person or something like that. A-CHAN was born in Tokyo in 1978. She moved to New York in 2006. She has been an assistant to photographer Robert Frank since 2007. Her solo exhibitions include: Gotham, Impossible Project Space, Tokyo, Japan, 2011; Country, Factory, Tokyo, Japan, 2005; Ban, Gallery Nadar, Osaka, Japan, 2004 and Atsuihi, Gallery Nadar, Tokyo, Japan, 2003. Her publications are: Vibrant Home (Steidl, 2012); Off Beat (Steidl, 2012); Lighting Store (Match and Company Co., Ltd., Tokyo, 2012); Picture (Self-Published, Tokyo, 2002). A-CHAN: Off Beat will be on view from March 28th through May 4th, 2013. 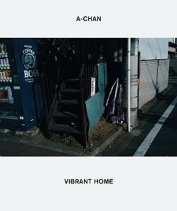 A-CHAN: Vibrant Home will be on view from May 8th through June 8th, 2013. Steven Kasher Gallery is located at 521 W. 23rd St., New York, NY 10011. Gallery hours are Tuesday through Saturday, 11am to 6pm.